One thing was certain, that the white kitten had had nothing to do with it:—it was the black kitten’s fault entirely. For the white kitten had been having its face washed by the old cat for the last quarter of an hour (and bearing it pretty well, considering); so you see that it couldn’t have had any hand in the mischief. The way Dinah washed her children’s faces was this: first she held the poor thing down by its ear with one paw, and then with the other paw she rubbed its face all over, the wrong way, beginning at the nose: and just now, as I said, she was hard at work on the white kitten, which was lying quite still and trying to purr—no doubt feeling that it was all meant for its good. ‘Oh, you wicked little thing!’ cried Alice, catching up the kitten, and giving it a little kiss to make it understand that it was in disgrace. ‘Really, Dinah ought to have taught you better manners! You ought, Dinah, you know you ought!’ she added, looking reproachfully at the old cat, and speaking in as cross a voice as she could manage—and then she scrambled back into the arm-chair, taking the kitten and the worsted with her, and began winding up the ball again. But she didn’t get on very fast, as she was talking all the time, sometimes to the kitten, and sometimes to herself. Kitty sat very demurely on her knee, pretending to watch the progress of the winding, and now and then putting out one paw and gently touching the ball, as if it would be glad to help, if it might. ‘Do you know what to-morrow is, Kitty?’ Alice began. ‘You’d have guessed if you’d been up in the window with me—only Dinah was making you tidy, so you couldn’t. I was watching the boys getting in sticks for the bonfire—and it wants plenty of sticks, Kitty! Only it got so cold, and it snowed so, they had to leave off. Never mind, Kitty, we’ll go and see the bonfire to-morrow.’ Here Alice wound two or three turns of the worsted round the kitten’s neck, just to see how it would look: this led to a scramble, in which the ball rolled down upon the floor, and yards and yards of it got unwound again. ‘Do you know, I was so angry, Kitty,’ Alice went on as soon as they were comfortably settled again, ‘when I saw all the mischief you had been doing, I was very nearly opening the window, and putting you out into the snow! And you’d have deserved it, you little mischievous darling! What have you got to say for yourself? Now don’t interrupt me!’ she went on, holding up one finger. ‘I’m going to tell you all your faults. Number one: you squeaked twice while Dinah was washing your face this morning. Now you can’t deny it, Kitty: I heard you! What’s that you say?’ (pretending that the kitten was speaking.) ‘Her paw went into your eye? Well, that’s your fault, for keeping your eyes open—if you’d shut them tight up, it wouldn’t have happened. Now don’t make any more excuses, but listen! Number two: you pulled Snowdrop away by the tail just as I had put down the saucer of milk before her! What, you were thirsty, were you? How do you know she wasn’t thirsty too? Now for number three: you unwound every bit of the worsted while I wasn’t looking! ‘That’s three faults, Kitty, and you’ve not been punished for any of them yet. You know I’m saving up all your punishments for Wednesday week—Suppose they had saved up all my punishments!’ she went on, talking more to herself than the kitten. ‘What would they do at the end of a year? I should be sent to prison, I suppose, when the day came. Or—let me see—suppose each punishment was to be going without a dinner: then, when the miserable day came, I should have to go without fifty dinners at once! Well, I shouldn’t mind that much! I’d far rather go without them than eat them! ‘Do you hear the snow against the window-panes, Kitty? How nice and soft it sounds! Just as if some one was kissing the window all over outside. I wonder if the snow loves the trees and fields, that it kisses them so gently? And then it covers them up snug, you know, with a white quilt; and perhaps it says, “Go to sleep, darlings, till the summer comes again.” And when they wake up in the summer, Kitty, they dress themselves all in green, and dance about—whenever the wind blows—oh, that’s very pretty!’ cried Alice, dropping the ball of worsted to clap her hands. ‘And I do so wish it was true! I’m sure the woods look sleepy in the autumn, when the leaves are getting brown. ‘Now, if you’ll only attend, Kitty, and not talk so much, I’ll tell you all my ideas about Looking-glass House. First, there’s the room you can see through the glass—that’s just the same as our drawing room, only the things go the other way. I can see all of it when I get upon a chair—all but the bit behind the fireplace. Oh! I do so wish I could see that bit! I want so much to know whether they’ve a fire in the winter: you never can tell, you know, unless our fire smokes, and then smoke comes up in that room too—but that may be only pretence, just to make it look as if they had a fire. Well then, the books are something like our books, only the words go the wrong way; I know that, because I’ve held up one of our books to the glass, and then they hold up one in the other room. ‘How would you like to live in Looking-glass House, Kitty? I wonder if they’d give you milk in there? Perhaps Looking-glass milk isn’t good to drink—But oh, Kitty! now we come to the passage. You can just see a little peep of the passage in Looking-glass House, if you leave the door of our drawing-room wide open: and it’s very like our passage as far as you can see, only you know it may be quite different on beyond. Oh, Kitty! how nice it would be if we could only get through into Looking-glass House! I’m sure it’s got, oh! such beautiful things in it! Let’s pretend there’s a way of getting through into it, somehow, Kitty. Let’s pretend the glass has got all soft like gauze, so that we can get through. Why, it’s turning into a sort of mist now, I declare! It’ll be easy enough to get through—’ She was up on the chimney-piece while she said this, though she hardly knew how she had got there. And certainly the glass was beginning to melt away, just like a bright silvery mist. ‘Oh! please don’t make such faces, my dear!’ she cried out, quite forgetting that the King couldn’t hear her. ‘You make me laugh so that I can hardly hold you! And don’t keep your mouth so wide open! All the ashes will get into it—there, now I think you’re tidy enough!’ she added, as she smoothed his hair, and set him upon the table near the Queen. There was a book lying near Alice on the table, and while she sat watching the White King (for she was still a little anxious about him, and had the ink all ready to throw over him, in case he fainted again), she turned over the leaves, to find some part that she could read, ‘—for it’s all in some language I don’t know,’ she said to herself. ‘But oh!’ thought Alice, suddenly jumping up, ‘if I don’t make haste I shall have to go back through the Looking-glass, before I’ve seen what the rest of the house is like! Let’s have a look at the garden first!’ She was out of the room in a moment, and ran down stairs—or, at least, it wasn’t exactly running, but a new invention of hers for getting down stairs quickly and easily, as Alice said to herself. She just kept the tips of her fingers on the hand-rail, and floated gently down without even touching the stairs with her feet; then she floated on through the hall, and would have gone straight out at the door in the same way, if she hadn’t caught hold of the door-post. She was getting a little giddy with so much floating in the air, and was rather glad to find herself walking again in the natural way. So, resolutely turning her back upon the house, she set out once more down the path, determined to keep straight on till she got to the hill. For a few minutes all went on well, and she was just saying, ‘I really shall do it this time—’ when the path gave a sudden twist and shook itself (as she described it afterwards), and the next moment she found herself actually walking in at the door. ‘But what could it do, if any danger came?’ Alice asked. This sounded a very good reason, and Alice was quite pleased to know it. ‘I never thought of that before!’ she said. ‘It’s my opinion that you never think at all,’ the Rose said in a rather severe tone. ‘I never saw anybody that looked stupider,’ a Violet said, so suddenly, that Alice quite jumped; for it hadn’t spoken before. ‘Are there any more people in the garden besides me?’ Alice said, not choosing to notice the Rose’s last remark. ‘Where does she wear the thorns?’ Alice asked with some curiosity. Alice looked round eagerly, and found that it was the Red Queen. ‘She’s grown a good deal!’ was her first remark. She had indeed: when Alice first found her in the ashes, she had been only three inches high—and here she was, half a head taller than Alice herself! Alice curtseyed again, as she was afraid from the Queen’s tone that she was a little offended: and they walked on in silence till they got to the top of the little hill. She glanced rather shyly at the real Queen as she said this, but her companion only smiled pleasantly, and said, ‘That’s easily managed. You can be the White Queen’s Pawn, if you like, as Lily’s too young to play; and you’re in the Second Square to begin with: when you get to the Eighth Square you’ll be a Queen—’ Just at this moment, somehow or other, they began to run. ‘While you’re refreshing yourself,’ said the Queen, ‘I’ll just take the measurements.’ And she took a ribbon out of her pocket, marked in inches, and began measuring the ground, and sticking little pegs in here and there. ‘Thirst quenched, I hope?’ said the Queen. ‘I—I didn’t know I had to make one—just then,’ Alice faltered out. ‘You should have said, “It’s extremely kind of you to tell me all this”—however, we’ll suppose it said—the Seventh Square is all forest—however, one of the Knights will show you the way—and in the Eighth Square we shall be Queens together, and it’s all feasting and fun!’ Alice got up and curtseyed, and sat down again. At the next peg the Queen turned again, and this time she said, ‘Speak in French when you can’t think of the English for a thing—turn out your toes as you walk—and remember who you are!’ She did not wait for Alice to curtsey this time, but walked on quickly to the next peg, where she turned for a moment to say ‘good-bye,’ and then hurried on to the last. How it happened, Alice never knew, but exactly as she came to the last peg, she was gone. Whether she vanished into the air, or whether she ran quickly into the wood (‘and she can run very fast!’ thought Alice), there was no way of guessing, but she was gone, and Alice began to remember that she was a Pawn, and that it would soon be time for her to move. Of course the first thing to do was to make a grand survey of the country she was going to travel through. ‘It’s something very like learning geography,’ thought Alice, as she stood on tiptoe in hopes of being able to see a little further. ‘Principal rivers—there are none. Principal mountains—I’m on the only one, but I don’t think it’s got any name. Principal towns—why, what are those creatures, making honey down there? They can’t be bees—nobody ever saw bees a mile off, you know—’ and for some time she stood silent, watching one of them that was bustling about among the flowers, poking its proboscis into them, ‘just as if it was a regular bee,’ thought Alice. ‘Tickets, please!’ said the Guard, putting his head in at the window. In a moment everybody was holding out a ticket: they were about the same size as the people, and quite seemed to fill the carriage. ‘I shall dream about a thousand pounds tonight, I know I shall!’ thought Alice. All this time the Guard was looking at her, first through a telescope, then through a microscope, and then through an opera-glass. At last he said, ‘You’re travelling the wrong way,’ and shut up the window and went away. Alice couldn’t see who was sitting beyond the Beetle, but a hoarse voice spoke next. ‘Change engines—’ it said, and was obliged to leave off. And after that other voices went on (‘What a number of people there are in the carriage!’ thought Alice), saying, ‘She must go by post, as she’s got a head on her—’ ‘She must be sent as a message by the telegraph—’ ‘She must draw the train herself the rest of the way—’ and so on. The little voice sighed deeply: it was very unhappy, evidently, and Alice would have said something pitying to comfort it, ‘If it would only sigh like other people!’ she thought. But this was such a wonderfully small sigh, that she wouldn’t have heard it at all, if it hadn’t come quite close to her ear. The consequence of this was that it tickled her ear very much, and quite took off her thoughts from the unhappiness of the poor little creature. ‘What kind of insect?’ Alice inquired a little anxiously. What she really wanted to know was, whether it could sting or not, but she thought this wouldn’t be quite a civil question to ask. ‘What, then you don’t—’ the little voice began, when it was drowned by a shrill scream from the engine, and everybody jumped up in alarm, Alice among the rest. The Horse, who had put his head out of the window, quietly drew it in and said, ‘It’s only a brook we have to jump over.’ Everybody seemed satisfied with this, though Alice felt a little nervous at the idea of trains jumping at all. ‘However, it’ll take us into the Fourth Square, that’s some comfort!’ she said to herself. In another moment she felt the carriage rise straight up into the air, and in her fright she caught at the thing nearest to her hand, which happened to be the Goat’s beard. It certainly was a very large Gnat: ‘about the size of a chicken,’ Alice thought. Still, she couldn’t feel nervous with it, after they had been talking together so long. ‘—then you don’t like all insects?’ the Gnat went on, as quietly as if nothing had happened. ‘What sort of insects do you rejoice in, where you come from?’ the Gnat inquired. ‘Of course they answer to their names?’ the Gnat remarked carelessly. ‘Well, there’s the Horse-fly,’ Alice began, counting off the names on her fingers. ‘What does it live on?’ Alice asked, with great curiosity. She very soon came to an open field, with a wood on the other side of it: it looked much darker than the last wood, and Alice felt a little timid about going into it. However, on second thoughts, she made up her mind to go on: ‘for I certainly won’t go back,’ she thought to herself, and this was the only way to the Eighth Square. Just then a Fawn came wandering by: it looked at Alice with its large gentle eyes, but didn’t seem at all frightened. ‘Here then! Here then!’ Alice said, as she held out her hand and tried to stroke it; but it only started back a little, and then stood looking at her again. ‘What do you call yourself?’ the Fawn said at last. Such a soft sweet voice it had! So they walked on together though the wood, Alice with her arms clasped lovingly round the soft neck of the Fawn, till they came out into another open field, and here the Fawn gave a sudden bound into the air, and shook itself free from Alice’s arms. ‘I’m a Fawn!’ it cried out in a voice of delight, ‘and, dear me! you’re a human child!’ A sudden look of alarm came into its beautiful brown eyes, and in another moment it had darted away at full speed. ‘I do believe,’ said Alice at last, ‘that they live in the same house! I wonder I never thought of that before—But I can’t stay there long. I’ll just call and say “how d’you do?” and ask them the way out of the wood. If I could only get to the Eighth Square before it gets dark!’ So she wandered on, talking to herself as she went, till, on turning a sharp corner, she came upon two fat little men, so suddenly that she could not help starting back, but in another moment she recovered herself, feeling sure that they must be. 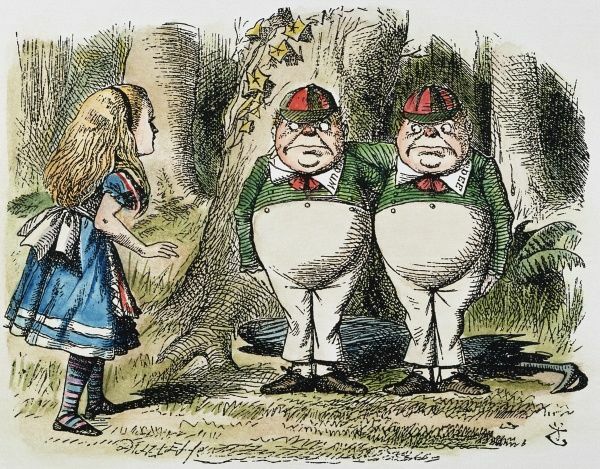 They were standing under a tree, each with an arm round the other’s neck, and Alice knew which was which in a moment, because one of them had ‘DUM’ embroidered on his collar, and the other ‘DEE.’ ‘I suppose they’ve each got “TWEEDLE” round at the back of the collar,’ she said to herself. ‘Nohow!’ Tweedledum cried out briskly, and shut his mouth up again with a snap. ‘Next Boy!’ said Alice, passing on to Tweedledee, though she felt quite certain he would only shout out ‘Contrariwise!’ and so he did. ‘You’ve been wrong!’ cried Tweedledum. ‘The first thing in a visit is to say “How d’ye do?” and shake hands!’ And here the two brothers gave each other a hug, and then they held out the two hands that were free, to shake hands with her. Alice did not like shaking hands with either of them first, for fear of hurting the other one’s feelings; so, as the best way out of the difficulty, she took hold of both hands at once: the next moment they were dancing round in a ring. This seemed quite natural (she remembered afterwards), and she was not even surprised to hear music playing: it seemed to come from the tree under which they were dancing, and it was done (as well as she could make it out) by the branches rubbing one across the other, like fiddles and fiddle-sticks. The other two dancers were fat, and very soon out of breath. ‘Four times round is enough for one dance,’ Tweedledum panted out, and they left off dancing as suddenly as they had begun: the music stopped at the same moment. ‘I hope you’re not much tired?’ she said at last. ‘Nohow. And thank you very much for asking,’ said Tweedledum. ‘What shall I repeat to her?’ said Tweedledee, looking round at Tweedledum with great solemn eyes, and not noticing Alice’s question. ‘“The Walrus and the Carpenter” is the longest,’ Tweedledum replied, giving his brother an affectionate hug. “I weep for you,” the Walrus said. This was a puzzler. After a pause, Alice began, ‘Well! They were both very unpleasant characters—’ Here she checked herself in some alarm, at hearing something that sounded to her like the puffing of a large steam-engine in the wood near them, though she feared it was more likely to be a wild beast. ‘Are there any lions or tigers about here?’ she asked timidly. ‘It’s only the Red King snoring,’ said Tweedledee. ‘Come and look at him!’ the brothers cried, and they each took one of Alice’s hands, and led her up to where the King was sleeping. ‘Isn’t he a lovely sight?’ said Tweedledum. Alice couldn’t say honestly that he was. He had a tall red night-cap on, with a tassel, and he was lying crumpled up into a sort of untidy heap, and snoring loud—‘fit to snore his head off!’ as Tweedledum remarked. ‘I’m afraid he’ll catch cold with lying on the damp grass,’ said Alice, who was a very thoughtful little girl. ‘Selfish things!’ thought Alice, and she was just going to say ‘Good-night’ and leave them, when Tweedledum sprang out from under the umbrella and seized her by the wrist. ‘Do you see that?’ he said, in a voice choking with passion, and his eyes grew large and yellow all in a moment, as he pointed with a trembling finger at a small white thing lying under the tree. ‘I knew it was!’ cried Tweedledum, beginning to stamp about wildly and tear his hair. ‘It’s spoilt, of course!’ Here he looked at Tweedledee, who immediately sat down on the ground, and tried to hide himself under the umbrella. ‘But it isn’t old!’ Tweedledum cried, in a greater fury than ever. ‘It’s new, I tell you—I bought it yesterday—my nice new RATTLE!’ and his voice rose to a perfect scream. All this time Tweedledee was trying his best to fold up the umbrella, with himself in it: which was such an extraordinary thing to do, that it quite took off Alice’s attention from the angry brother. But he couldn’t quite succeed, and it ended in his rolling over, bundled up in the umbrella, with only his head out: and there he lay, opening and shutting his mouth and his large eyes—‘looking more like a fish than anything else,’ Alice thought. ‘Of course you agree to have a battle?’ Tweedledum said in a calmer tone. Alice said afterwards she had never seen such a fuss made about anything in all her life—the way those two bustled about—and the quantity of things they put on—and the trouble they gave her in tying strings and fastening buttons—‘Really they’ll be more like bundles of old clothes than anything else, by the time they’re ready!’ she said to herself, as she arranged a bolster round the neck of Tweedledee, ‘to keep his head from being cut off,’ as he said. ‘Well—yes—a little,’ Alice replied gently. ‘Then you’d better not fight to-day,’ said Alice, thinking it a good opportunity to make peace. ‘Let’s fight till six, and then have dinner,’ said Tweedledum. Alice laughed. ‘You must hit the trees pretty often, I should think,’ she said. ‘And all about a rattle!’ said Alice, still hoping to make them a little ashamed of fighting for such a trifle. ‘I wish the monstrous crow would come!’ thought Alice. ‘It’s the crow!’ Tweedledum cried out in a shrill voice of alarm: and the two brothers took to their heels and were out of sight in a moment. ‘I’m very glad I happened to be in the way,’ Alice said, as she helped her to put on her shawl again. It would have been all the better, as it seemed to Alice, if she had got some one else to dress her, she was so dreadfully untidy. ‘Every single thing’s crooked,’ Alice thought to herself, ‘and she’s all over pins!—may I put your shawl straight for you?’ she added aloud. ‘It must come sometimes to “jam to-day,”’ Alice objected. ‘What sort of things do you remember best?’ Alice ventured to ask. ‘Suppose he never commits the crime?’ said Alice. ‘That would be all the better, wouldn’t it?’ the Queen said, as she bound the plaster round her finger with a bit of ribbon. ‘Only for faults,’ said Alice. ‘And you were all the better for it, I know!’ the Queen said triumphantly. ‘But if you hadn’t done them,’ the Queen said, ‘that would have been better still; better, and better, and better!’ Her voice went higher with each ‘better,’ till it got quite to a squeak at last. ‘When do you expect to do it?’ Alice asked, feeling very much inclined to laugh. ‘When I fasten my shawl again,’ the poor Queen groaned out: ‘the brooch will come undone directly. Oh, oh!’ As she said the words the brooch flew open, and the Queen clutched wildly at it, and tried to clasp it again. ‘Take care!’ cried Alice. ‘You’re holding it all crooked!’ And she caught at the brooch; but it was too late: the pin had slipped, and the Queen had pricked her finger. ‘But why don’t you scream now?’ Alice asked, holding her hands ready to put over her ears again. ‘Only it is so very lonely here!’ Alice said in a melancholy voice; and at the thought of her loneliness two large tears came rolling down her cheeks. Alice could not help laughing at this, even in the midst of her tears. ‘Can you keep from crying by considering things?’ she asked. ‘Then I hope your finger is better now?’ Alice said very politely, as she crossed the little brook after the Queen. ‘Oh, much better!’ cried the Queen, her voice rising to a squeak as she went on. ‘Much be-etter! Be-etter! Be-e-e-etter! Be-e-ehh!’ The last word ended in a long bleat, so like a sheep that Alice quite started. She looked at the Queen, who seemed to have suddenly wrapped herself up in wool. Alice rubbed her eyes, and looked again. She couldn’t make out what had happened at all. Was she in a shop? And was that really—was it really a sheep that was sitting on the other side of the counter? Rub as she could, she could make nothing more of it: she was in a little dark shop, leaning with her elbows on the counter, and opposite to her was an old Sheep, sitting in an arm-chair knitting, and every now and then leaving off to look at her through a great pair of spectacles. ‘What is it you want to buy?’ the Sheep said at last, looking up for a moment from her knitting. But even this plan failed: the ‘thing’ went through the ceiling as quietly as possible, as if it were quite used to it. ‘Are you a child or a teetotum?’ the Sheep said, as she took up another pair of needles. ‘You’ll make me giddy soon, if you go on turning round like that.’ She was now working with fourteen pairs at once, and Alice couldn’t help looking at her in great astonishment. ‘Can you row?’ the Sheep asked, handing her a pair of knitting-needles as she spoke. ‘Yes, a little—but not on land—and not with needles—’ Alice was beginning to say, when suddenly the needles turned into oars in her hands, and she found they were in a little boat, gliding along between banks: so there was nothing for it but to do her best. ‘Feather!’ cried the Sheep, as she took up another pair of needles. This didn’t sound like a remark that needed any answer, so Alice said nothing, but pulled away. There was something very queer about the water, she thought, as every now and then the oars got fast in it, and would hardly come out again. ‘Didn’t you hear me say “Feather”?’ the Sheep cried angrily, taking up quite a bunch of needles. ‘I only hope the boat won’t tipple over!’ she said to herself. ‘Oh, what a lovely one! Only I couldn’t quite reach it.’ ‘And it certainly did seem a little provoking (‘almost as if it happened on purpose,’ she thought) that, though she managed to pick plenty of beautiful rushes as the boat glided by, there was always a more lovely one that she couldn’t reach. ‘The prettiest are always further!’ she said at last, with a sigh at the obstinacy of the rushes in growing so far off, as, with flushed cheeks and dripping hair and hands, she scrambled back into her place, and began to arrange her new-found treasures. They hadn’t gone much farther before the blade of one of the oars got fast in the water and wouldn’t come out again (so Alice explained it afterwards), and the consequence was that the handle of it caught her under the chin, and, in spite of a series of little shrieks of ‘Oh, oh, oh!’ from poor Alice, it swept her straight off the seat, and down among the heap of rushes. However, she wasn’t hurt, and was soon up again: the Sheep went on with her knitting all the while, just as if nothing had happened. ‘That was a nice crab you caught!’ she remarked, as Alice got back into her place, very much relieved to find herself still in the boat. ‘Was it? I didn’t see it,’ Said Alice, peeping cautiously over the side of the boat into the dark water. ‘I wish it hadn’t let go—I should so like to see a little crab to take home with me!’ But the Sheep only laughed scornfully, and went on with her knitting. ‘Are there many crabs here?’ said Alice. ‘To buy!’ Alice echoed in a tone that was half astonished and half frightened—for the oars, and the boat, and the river, had vanished all in a moment, and she was back again in the little dark shop. ‘Fivepence farthing for one—Twopence for two,’ the Sheep replied. ‘Then two are cheaper than one?’ Alice said in a surprised tone, taking out her purse. ‘Only you must eat them both, if you buy two,’ said the Sheep. The Sheep took the money, and put it away in a box: then she said ‘I never put things into people’s hands—that would never do—you must get it for yourself.’ And so saying, she went off to the other end of the shop, and set the egg upright on a shelf. It might have been written a hundred times, easily, on that enormous face. Humpty Dumpty was sitting with his legs crossed, like a Turk, on the top of a high wall—such a narrow one that Alice quite wondered how he could keep his balance—and, as his eyes were steadily fixed in the opposite direction, and he didn’t take the least notice of her, she thought he must be a stuffed figure after all. ‘And how exactly like an egg he is!’ she said aloud, standing with her hands ready to catch him, for she was every moment expecting him to fall. ‘I said you looked like an egg, Sir,’ Alice gently explained. ‘And some eggs are very pretty, you know’ she added, hoping to turn her remark into a sort of a compliment. ‘That last line is much too long for the poetry,’ she added, almost out loud, forgetting that Humpty Dumpty would hear her. ‘Why do you sit out here all alone?’ said Alice, not wishing to begin an argument. ‘To send all his horses and all his men,’ Alice interrupted, rather unwisely. ‘I’m afraid I can’t quite remember it,’ Alice said very politely. ‘I though you meant “How old are you?”’ Alice explained. ‘I never ask advice about growing,’ Alice said indignantly. ‘Too proud?’ the other inquired. ‘What a beautiful belt you’ve got on!’ Alice suddenly remarked. ‘I know it’s very ignorant of me,’ Alice said, in so humble a tone that Humpty Dumpty relented. ‘Is it really?’ said Alice, quite pleased to find that she had chosen a good subject, after all. ‘I beg your pardon?’ Alice said with a puzzled air. ‘I’m not offended,’ said Humpty Dumpty. Alice considered a little. ‘I like birthday presents best,’ she said at last. ‘Three hundred and sixty-five,’ said Alice. Humpty Dumpty looked doubtful. ‘I’d rather see that done on paper,’ he said. Humpty Dumpty took the book, and looked at it carefully. ‘That seems to be done right—’ he began. ‘You’re holding it upside down!’ Alice interrupted. ‘That’s a great deal to make one word mean,’ Alice said in a thoughtful tone. ‘Oh!’ said Alice. She was too much puzzled to make any other remark. ‘And “the wabe” is the grass-plot round a sun-dial, I suppose?’ said Alice, surprised at her own ingenuity. ‘And a long way beyond it on each side,’ Alice added. ‘Oh, it needn’t come to that!’ Alice hastily said, hoping to keep him from beginning. Alice felt that in that case she really ought to listen to it, so she sat down, and said ‘Thank you’ rather sadly. only I don’t sing it,’ he added, as an explanation. ‘I see you don’t,’ said Alice. ‘If you can see whether I’m singing or not, you’ve sharper eyes than most.’ Humpty Dumpty remarked severely. Alice was silent. ‘Thank you very much,’ said Alice. ‘I will, if I can remember it so long,’ said Alice. ‘I’m afraid I don’t quite understand,’ said Alice. ‘It gets easier further on,’ Humpty Dumpty replied. ‘Is that all?’ Alice timidly asked. This was rather sudden, Alice thought: but, after such a very strong hint that she ought to be going, she felt that it would hardly be civil to stay. So she got up, and held out her hand. ‘Good-bye, till we meet again!’ she said as cheerfully as she could. ‘The face is what one goes by, generally,’ Alice remarked in a thoughtful tone. Alice waited a minute to see if he would speak again, but as he never opened his eyes or took any further notice of her, she said ‘Good-bye!’ once more, and, getting no answer to this, she quietly walked away: but she couldn’t help saying to herself as she went, ‘Of all the unsatisfactory—’ (she repeated this aloud, as it was a great comfort to have such a long word to say) ‘of all the unsatisfactory people I ever met—’ She never finished the sentence, for at this moment a heavy crash shook the forest from end to end. ‘I see nobody on the road,’ said Alice. ‘I beg your pardon?’ said Alice. ‘It isn’t respectable to beg,’ said the King. ‘This young lady loves you with an H,’ the King said, introducing Alice in the hope of turning off the Messenger’s attention from himself—but it was no use—the Anglo-Saxon attitudes only got more extraordinary every moment, while the great eyes rolled wildly from side to side. ‘Another sandwich!’ said the King. ‘There’s nothing but hay left now,’ the Messenger said, peeping into the bag. ‘Hay, then,’ the King murmured in a faint whisper. Alice was glad to see that it revived him a good deal. ‘There’s nothing like eating hay when you’re faint,’ he remarked to her, as he munched away. ‘I didn’t say there was nothing better,’ the King replied. ‘I said there was nothing like it.’ Which Alice did not venture to deny. ‘Who did you pass on the road?’ the King went on, holding out his hand to the Messenger for some more hay. ‘It would have to be a very tiny earthquake!’ thought Alice. ‘Who are at it again?’ she ventured to ask. ‘Why the Lion and the Unicorn, of course,’ said the King. ‘Does—the one—that wins—get the crown?’ she asked, as well as she could, for the run was putting her quite out of breath. ‘He’s only just out of prison, and he hadn’t finished his tea when he was sent in,’ Haigha whispered to Alice: ‘and they only give them oyster-shells in there—so you see he’s very hungry and thirsty. How are you, dear child?’ he went on, putting his arm affectionately round Hatta’s neck. ‘Were you happy in prison, dear child?’ said Haigha. ‘Speak, can’t you!’ Haigha cried impatiently. But Hatta only munched away, and drank some more tea. ‘Then I suppose they’ll soon bring the white bread and the brown?’ Alice ventured to remark. There was a pause in the fight just then, and the Lion and the Unicorn sat down, panting, while the King called out ‘Ten minutes allowed for refreshments!’ Haigha and Hatta set to work at once, carrying rough trays of white and brown bread. Alice took a piece to taste, but it was very dry. ‘I don’t think they’ll fight any more to-day,’ the King said to Hatta: ‘go and order the drums to begin.’ And Hatta went bounding away like a grasshopper. ‘But aren’t you going to run and help her?’ Alice asked, very much surprised at his taking it so quietly. At this moment the Unicorn sauntered by them, with his hands in his pockets. ‘I had the best of it this time?’ he said to the King, just glancing at him as he passed. ‘It didn’t hurt him,’ the Unicorn said carelessly, and he was going on, when his eye happened to fall upon Alice: he turned round rather instantly, and stood for some time looking at her with an air of the deepest disgust. ‘What—is—this?’ he said at last. ‘It can talk,’ said Haigha, solemnly. The Lion had joined them while this was going on: he looked very tired and sleepy, and his eyes were half shut. ‘What’s this!’ he said, blinking lazily at Alice, and speaking in a deep hollow tone that sounded like the tolling of a great bell. The Lion looked at Alice wearily. ‘Are you animal—vegetable—or mineral?’ he said, yawning at every other word. ‘It’s a fabulous monster!’ the Unicorn cried out, before Alice could reply. ‘What a fight we might have for the crown, now!’ the Unicorn said, looking slyly up at the crown, which the poor King was nearly shaking off his head, he trembled so much. ‘I should win easy,’ said the Lion. ‘I’m not so sure of that,’ said the Unicorn. ‘Why, I beat you all round the town, you chicken!’ the Lion replied angrily, half getting up as he spoke. This sounded nonsense, but Alice very obediently got up, and carried the dish round, and the cake divided itself into three pieces as she did so. ‘Now cut it up,’ said the Lion, as she returned to her place with the empty dish. Startled as she was, Alice was more frightened for him than for herself at the moment, and watched him with some anxiety as he mounted again. As soon as he was comfortably in the saddle, he began once more ‘You’re my—’ but here another voice broke in ‘Ahoy! Ahoy! Check!’ and Alice looked round in some surprise for the new enemy. ‘I didn’t know it,’ the Knight said, a shade of vexation passing over his face. ‘Then all the things must have fallen out! And the box is no use without them.’ He unfastened it as he spoke, and was just going to throw it into the bushes, when a sudden thought seemed to strike him, and he hung it carefully on a tree. ‘Can you guess why I did that?’ he said to Alice. ‘But you’ve got a bee-hive—or something like one—fastened to the saddle,’ said Alice. ‘Not very nice alone,’ he interrupted, quite eagerly: ‘but you’ve no idea what a difference it makes mixing it with other things—such as gunpowder and sealing-wax. And here I must leave you.’ They had just come to the end of the wood. So they shook hands, and then the Knight rode slowly away into the forest. ‘It won’t take long to see him off, I expect,’ Alice said to herself, as she stood watching him. ‘There he goes! Right on his head as usual! However, he gets on again pretty easily—that comes of having so many things hung round the horse—’ So she went on talking to herself, as she watched the horse walking leisurely along the road, and the Knight tumbling off, first on one side and then on the other. After the fourth or fifth tumble he reached the turn, and then she waved her handkerchief to him, and waited till he was out of sight. ‘Hush-a-by lady, in Alice’s lap! ‘What am I to do?’ exclaimed Alice, looking about in great perplexity, as first one round head, and then the other, rolled down from her shoulder, and lay like a heavy lump in her lap. ‘I don’t think it ever happened before, that any one had to take care of two Queens asleep at once! No, not in all the History of England—it couldn’t, you know, because there never was more than one Queen at a time. Do wake up, you heavy things!’ she went on in an impatient tone; but there was no answer but a gentle snoring. ‘“O Looking-Glass creatures,” quoth Alice, “draw near! ‘Snowdrop, my pet!’ she went on, looking over her shoulder at the White Kitten, which was still patiently undergoing its toilet, ‘when will Dinah have finished with your White Majesty, I wonder? That must be the reason you were so untidy in my dream—Dinah! do you know that you’re scrubbing a White Queen? Really, it’s most disrespectful of you! ‘And what did Dinah turn to, I wonder?’ she prattled on, as she settled comfortably down, with one elbow in the rug, and her chin in her hand, to watch the kittens. ‘Tell me, Dinah, did you turn to Humpty Dumpty? I think you did—however, you’d better not mention it to your friends just yet, for I’m not sure. ‘By the way, Kitty, if only you’d been really with me in my dream, there was one thing you would have enjoyed—I had such a quantity of poetry said to me, all about fishes! To-morrow morning you shall have a real treat. All the time you’re eating your breakfast, I’ll repeat “The Walrus and the Carpenter” to you; and then you can make believe it’s oysters, dear! ‘Now, Kitty, let’s consider who it was that dreamed it all. This is a serious question, my dear, and you should not go on licking your paw like that—as if Dinah hadn’t washed you this morning! You see, Kitty, it must have been either me or the Red King. He was part of my dream, of course—but then I was part of his dream, too! Was it the Red King, Kitty? You were his wife, my dear, so you ought to know—Oh, Kitty, do help to settle it! I’m sure your paw can wait!’ But the provoking kitten only began on the other paw, and pretended it hadn’t heard the question.